Note: If the format seems askew then please try the FimFiction version, which I actually prefer to the GDocs one since it features larger pictures. "May I have a story please?" said Dinky Doo. "What kind of story would you like to hear?" I said. "Could you very sweetly tell me one about you?" "Why would you want to hear a story about me?" "Because mummy is a very special sort of mare." "Well, I suppose I can try," I said. Once upon a time, a very long time ago now – it must have been at least a month or two – Ditzy Doo decided to go for a walk on a particularly blustery day. (“Was that you?” said Dinky Doo. Now as I was saying, Ditzy Doo had decided to go for a walk on this particularly blustery day so that she could visit her thoughtful spot, and the reason she wanted to visit her thoughtful spot was so that she could think of something to do while her daughter was away. Normally she would have flown the short distance, but this day was so blustery that she feared she might be blown around like a bubble caught in the wind. When she arrived, she was surprised to see that her friend Pinkie Pie was already there. She was even more surprised when Pinkie Pie pounced on her to say 'hello'. “Hello Ditzy! Are you having a happy Windsday?” said Pinkie. Ditzy began to worry that her friend might get carried away with them. “Oh yeah!” said Pinkie, stepping off the pegasus and helping her to stand up. “Dinky's staying with her grandma,” said Ditzy. Sure enough, the orange farm pony was walking down the slope and into their sheltered spot to join them. Ditzy noticed that Applejack was not wearing her usual hat. She hoped that it had not gotten blown away and had instead been left in a Safe Place. 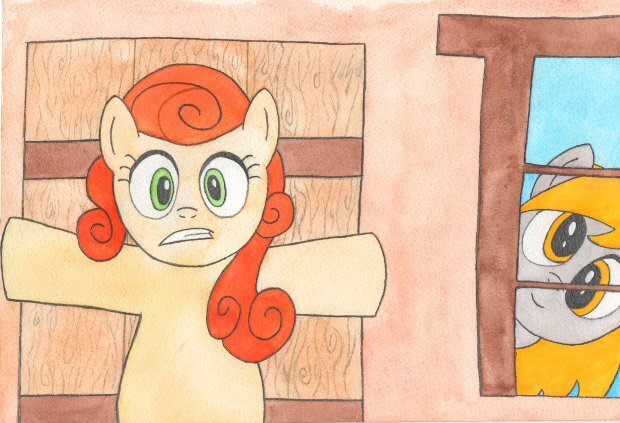 But what if it had gotten blown away and Applejack hadn't noticed? Ditzy thought that she would have been very embarrassed if such a thing had happened to her and it had to be pointed out by somepony. Ditzy decided that it would be best if she did not mention the missing hat. “Good morning Applejack,” said Ditzy. And she was. Pinkie's last bounce had sent her too high and her balloons had been caught by the wind. 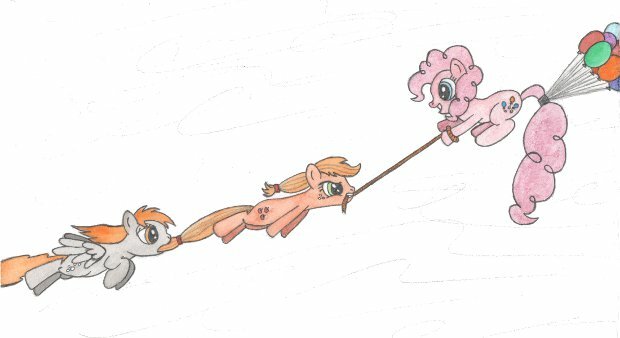 “Hold on Pinkie Pie!” yelled Applejack as she twirled a rope which she had thoughtfully brought with her. She threw the lasso and managed to catch Pinkie's leg before she was taken out of reach. Applejack dug her hooves into the ground and tried to halt Pinkie's progress, but the wind was too strong and lifted her into the air as well. “Ditzy, we need your help!” said Applejack, through the rope she held in her mouth. 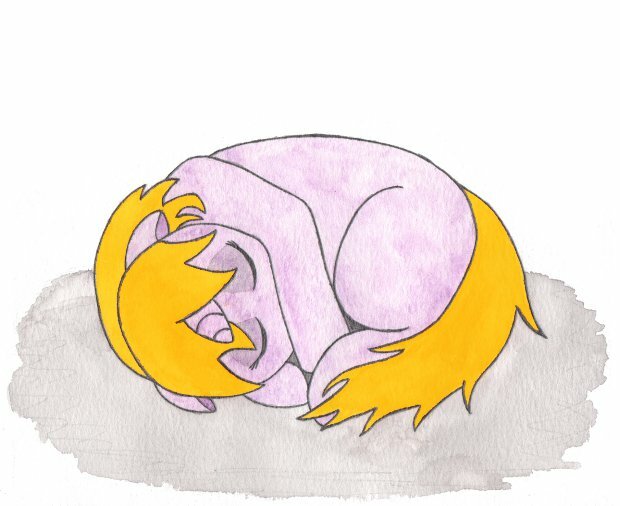 Moving quickly, Ditzy Doo grabbed Applejack's tail with her teeth and held on tightly, determined to help her friends. But Pinkie barely slowed at all, and all three of them were soon flying over the slope and heading into Ponyville. This blustery day was turning out to be quite eventful, and Ditzy Doo was enjoying herself. She decided to make up a poem, but since her mouth was full she had to hum it rather than say it. is that, like a kite, you could take flight. Is that you may have a bit further to fall. They flew through the park, and Pinkie waved down to Lyra and Bonbon, which finally convinced Lyra that perhaps Bonbon was right and it was too windy for sitting on a bench. They flew over the shops and overheard Mr. Breezy complaining to no-pony in particular that no one would want to buy a fan when the weather was like this, but that it was okay because just the other day somepony had come into his store and said 'Good morning,' which was nice. They flew past the school house and saw Berry Punch playing with her little filly in the playground. 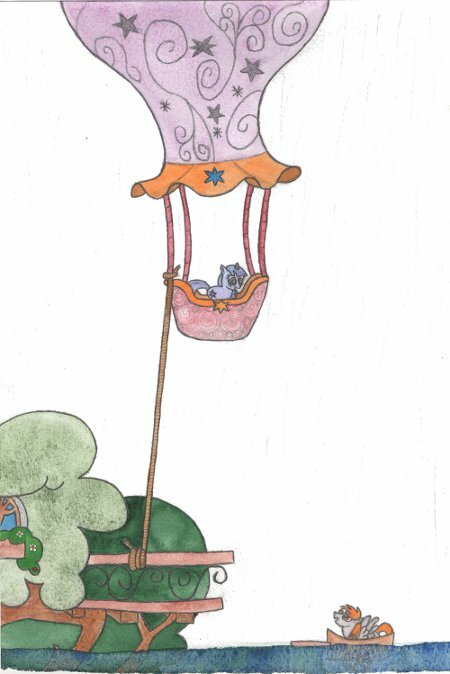 Ditzy could hear Berry telling her daughter “Just one more swing and then we must be going,” and her filly would say “Look at me swinging!” and swing once again. The trio's journey ended as Pinkie Pie collided tail-first with the great big tree that housed the town library. She was soon joined by the other two ponies, and all three of them became plastered against an upper window. “Twilight,” said a voice from inside. Spike shrugged and undid the latch which was keeping the window shut. The gale blew it wide open, nearly knocking the baby dragon off his feet, and causing Pinkie Pie, Applejack, and Ditzy Doo to tumble inside. After jumping up several times and with much flailing of his legs, Spike managed to close the window again. Outside, the wind howled because its new toy had been taken away, but it soon forgot and found some leaves to chase around instead. “That was fun!” said Pinkie Pie. Twilight Sparkle looked up from her book at the pile of ponies that now inhabited her library's floor. “I was expecting you to come through the door,” she said, having not thought of anything else to say. “Hi Twilight! I was a kite!” said Pinkie Pie. “You are coming to the party this afternoon, aren't you?” asked Pinkie Pie. “Well shucks, looks like I've been volunteered. I'll see y'all later,” Applejack said, trotting quickly after Pinkie Pie. Ditzy looked up at the clock and saw that it was almost time for a Little Something, and if she went to see her good friend Carrot Top, then by the time she got there it would be time for a Little Something. She said goodbye to Twilight and set off after the other two ponies so that she could walk with company. but a so to track. As they started to climb the hill that led to the farm, Applejack and Ditzy Doo made Pinkie promise to keep her hooves on the ground until she was safely inside, since the farm was higher up than the rest of Ponyville and the wind might blow her away again. While Ditzy walked, a little poem popped into her head and soon it popped out of her mouth because sometimes these things need to be said even if your mind is preoccupied with an Important Matter and you can't think of many words. After saying it once, she found herself saying it again and this time Pinkie Pie joined in. Pinkie enjoyed it so much that she thought about going with Ditzy to see Carrot Top for a Little Something as well, but then she remembered that she had to get things ready for the party, so she said, “Ta ta for now,” instead. After leaving her companions, Ditzy Doo made her way to Carrot Top's house. She stepped carefully around where the carrots had been planted, because she knew that plants live in beds, and it would have been rude to wake them. She heard a commotion from inside, followed by a voice. So Ditzy Doo, being a mare of very little brain, sat down and gave this a Good Think. If Carrot Top wasn't there then Ditzy couldn't have heard her answer, so she must have imagined it. But, she reasoned, it was time for a Little Something, so Carrot Top would probably be back soon and she may have even left a Little Something out on the table for when she returned. And if Carrot did return to find that her good friend Ditzy Doo was waiting for her so that she could have a Little Something in company, then Carrot probably wouldn't mind if she found that Ditzy had eaten just a smidgen of the Little Something while she was waiting. Carrot would smile and say things like 'It's so good to see you,' and 'Please help yourself,' and 'Do go on.' Carrot might even show her where she kept the Key To The Fridge. Ditzy peered into the window to see if this was the case. “Hello Carrot Top,” said Ditzy, waving to her friend. Ditzy looked at her reflection in the glass to make sure that it was. Carrot seemed relieved, but then she glanced up at the clock and suddenly didn't seem quite so relieved any more. “I guess you'd better come in then,” she said slowly and opened the door. Ditzy thanked her friend and made her way to the kitchen. Carrot plodded along behind her. After Ditzy had finished her second plateful, and was patiently waiting for her third, she asked Carrot Top who she had thought was knocking on her door. “I found them out front, trying to dig up the carrot patch. I explained that the carrots had only been planted a few days ago and they still needed time to grow, but then the orange one, Scootaloo I think, said they just needed find a way to make them grow faster, and then Sweetie Belle said that Twilight must have some kind of spell or potion for it. And then they ran off towards town,” said Carrot. Ditzy continued to nod, but she realised that she had been thinking about her empty plate and had missed most of what Carrot had told her. So Ditzy said, “Well, of course,” in a manner that hopefully suggested that she had been listening. Carrot didn't seem to notice and said that she hoped that Apple Bloom and her friends had gotten bored and found something else to do. She then offered to get Ditzy another plateful, which was something the pegasus had no trouble in hearing. While she ate, Ditzy told Carrot about the party in the afternoon that she must be sure to attend, and Carrot said that she would be sure to attend it. A short time later, Ditzy finished her last mouthful, shook Carrot lovingly by the hoof, and said that she must be going now. “Are you sure you wouldn't like anything else?” said Carrot politely. “Is there anything else?” asked Ditzy hopefully. “No, there isn't,” Carrot answered without having to look in the fridge. “I thought as much,” said Ditzy, and she thanked Carrot for her hospitality before heading back outside and into the blustery day. On her way back, the clouds opened up and set about making everything a good deal wetter. It rained, and it rained, and it rained. So by the time Ditzy had gotten home she was very wet indeed. Once inside, she wrapped herself in towels to dry herself off and started to think about what she should do now that it was raining. She remembered that Twilight had said she was going to do some reading while the weather was bad, so Ditzy thought that she should do the same. She picked up her favourite book, sat down on the sofa, and started to read. She read, and she read, and she read, and then her sofa started to float, so she stopped reading and had a look around. The sitting room was full of water. “Oh bother,” said Ditzy Doo, and she flew up the stairs to take a look out of her bedroom window. She saw that it wasn't just her house that had been flooded, but the streets as well. She knew that there must have been a lot of rain up in the mountains for the river to overflow like this and try to take up residence in Ponyville. She also noticed that the water level was rapidly rising, and that it had already begun to climb up the stairs behind her; she didn't know how high it would get, but she had a feeling that she couldn't stay where she was. Luckily, she spotted a large, wooden cart floating down the street towards her. landing safely on the cart. So Ditzy and her cart travelled down the flooded streets of Ponyville, looking up at the ponies who had climbed onto their roofs and looking around at the ponies who had found similar floating objects to cling onto. 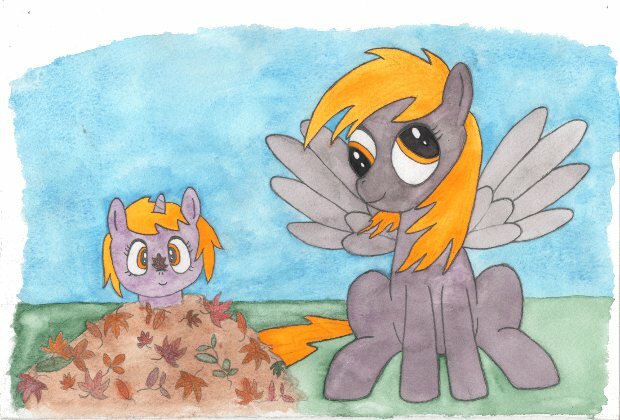 The ponies around Ditzy looked back at her with a mix of confusion and expectation, which seemed odd to Ditzy because she thought they would be looking around for a pegasus to come along and take them to a Safe Place. The afternoon wasn't as blustery as the morning had been, so flying shouldn't be dangerous any more. Ditzy began to think about the last flood that had happened in Ponyville. When it was over, they had to call in teams of unicorns from Canterlot to help them dry everything off. She hoped this one would be over quickly, although she quite liked floating between the houses. She had decided to call her cart The Floating Mare, which she thought was a fine name for such a Grand Vessel. The water's flow brought The Floating Mare and its passenger towards the library, and Ditzy could see that Twilight's hot air balloon was floating above the great tree, being buffeted by the wind. Since it wasn't floating off, Ditzy assumed that it must be tied down, though at this distance she couldn't see a rope. The tree itself was mostly underwater by now. She thought about flying up to the balloon's basket to see if Twilight was inside, when she suddenly realised that she was a pegasus and could of helped those ponies that had been stuck on their rooftops. Ditzy looked back the way she had come and saw several pegasi already helping to carry the stranded ponies towards Sweet Apple Acres. She was able to see that the farm they were heading to was safe from the water, being situated on its hill outside of town. She felt very Foolish and Uncomfortable for forgetting that she could have helped those ponies in the first place and began to think that maybe she should run away to Sea to be a Sailor. Ditzy was thinking about how good a Sailor she would make, when a voice called to her from above. She looked up and found that she had been brought close to the hot air balloon and Twilight was looking down at her from its basket. “Hello Twilight,” Ditzy called back, and she flapped her wings to stop the current from pulling her away. Ditzy was relieved to hear that, but then she noticed that several books had already floated out the window and were being carried away from the library. “What about those ones?” Ditzy said, pointing to the escaping books as best she could. “I don't think that's a good idea Twilight,” said Spike, from beneath the small pile of waterproof books he was using to try and keep himself dry. So, still thinking this was a bad idea, Spike cut the rope. The wind immediately dragged the balloon away from the library in completely the wrong direction. “Dumb wind, not that way!” Twilight yelled. “I told you it wasn't a good idea,” Spike muttered. Ditzy Doo suddenly thought of a great way to Be Useful, which would mean that she wouldn't have to run away and be a Sailor after all. “Twilight!” she shouted towards the retreating balloon, “I, Ditzy Doo, will save your books!” Although she couldn't be sure if she had been heard or not. Ditzy Doo and The Floating Mare set off. The current was weak but it was taking her and the books in the same direction, so Ditzy just needed to flap her wings to help steer or go faster. If she had been a unicorn she could have picked up the books with magic when she got close, but since she wasn't she had to wait until they got caught on something that was sticking out of the water, like a chimney or the top of a tree. She hadn't managed to collect many books, but she hoped to have more luck when they passed through the cluster of tall trees in the park. As she approached, she noticed that one of the trees had three little ponies clinging to the upper branches, trying to keep out of the water. It was Sweetie Belle, Apple Bloom, and Scootaloo. “What are you girls doing up in that tree?” asked Ditzy Doo. Ditzy Doo found herself faced with a difficult choice; on the one hoof she had made a promise to Twilight, and on the other she knew that those little ponies needed her help. She quickly reached a decision, and piloted The Floating Mare into some of the tree's lower branches, which got the vessel stuck so that it wouldn't drift away. She flew up to each of the girls and lowered them into the cart. It was a tight squeeze, and Scootaloo complained that it all came from not making carts big enough, and Sweetie Belle said that it really came from eating too much, and Apple Bloom asked Sweetie Belle to be careful about where she pointed her horn, and then they all stopped talking and looked up at Ditzy Doo, who was hovering in front of them Deep In Thought. She was thinking about how to get The Floating Mare and its three passengers to the safety of Sweet Apple Acres. The cart was certainly too small for her to fit inside as well, and there wasn't enough of it sticking out the water for her to push it along while flying. Then she began to think about pushing it along while swimming; it would be hard work to go against the current, but Ditzy Doo's wings were quite strong and she knew she was good at using them underwater. 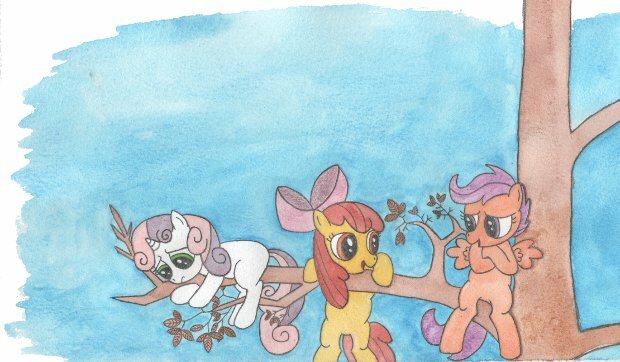 Under the watchful eyes of Apple Bloom, Sweetie Belle, and Scootaloo, Ditzy Doo untangled The Floating Mare from the tree branches and set it adrift. She dove into the water and began pushing it along. Bracing her front legs against the cart and paddling with her back, she used powerful strokes from her wings to propel them through the water. It was slow going at first, but Ditzy soon found her rhythm, sending up a shower of foam and bubbles each time her wings broke the surface. Their pace quickened, and Sweetie Belle tried to and hide under Scootaloo, who was busy watching Ditzy Doo and imagining what it would be like when her own wings were all grown up. They travelled back through Ponyville, and saw that only the very tops of the tallest houses were still above the water. Even the library's tree was now just a few upper branches poking out of the swirling blue. Apple Bloom looked ahead of them and called out directions to Ditzy Doo so they wouldn't crash into anything. When she stopped using her hooves to cover her eyes, Sweetie Belle spotted something above them and called out for everyone to look up. A pegasus was following them from the sky, leaving a rainbow trail in the air behind her. She was soon joined by other pegasi, who formed up into a giant letter 'V' that pointed towards Sweet Apple Acres. Seeing this display, Ditzy Doo swam even harder, and they soon reached Applejack's farm. A crowd of cheering ponies greeted them as they arrived and helped the three little fillies disembark The Floating Mare. Ditzy Doo climbed out of the water and was nearly knocked over when Apple Bloom, Sweetie Belle, and Scootaloo ran up and hugged her. “Thank you, thank you, thank you!” said the three little ponies. The crowd parted to allow Twilight Sparkle and the Mayor to walk through, followed closely by Applejack and Rarity. When she saw Twilight, Ditzy suddenly remembered the promise that she'd made. “An' I reckon that a hero deserves a hero party,” said Applejack. “Oh, I think that can be arranged,” said Twilight, smiling as she watched an excited pink pony bounce through the crowd. “Did I hear that somepony needed a hero party?” said Pinkie Pie. And so Ditzy Doo and all the other ponies enjoyed the party in Applejack's barn, which had turned into a hero party. They ate cakes and played games until it was dark outside and they all felt tired. The water had begun to leave and the rain clouds had wandered off, but since all the houses were still wet everypony either spent the night in Applejack's barn or out in the fields sleeping under the stars. And since its gotten dark here too, and I'm getting tired, I think this where we shall end the story. Dinky Doo lifted her head from where it had been resting against my wing, and tried to say that she wasn't tired, but this was made difficult by a yawn that escaped her mouth in between words. “Or maybe I am just a little tired,” she said. “I think it's time that we all went to bed,” I said. She smiled because she knew what I really meant and went out . 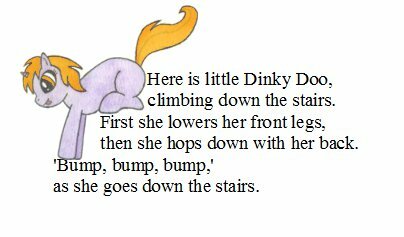 . . and in a moment I heard her – 'bump, bump, bump' – hopping up the stairs.